The Football Association has increased ticket prices for next month's FA Cup final by up to 22% compared to 2010. The most expensive ticket to watch the Wembley showpiece on 14 May will now be £115, compared to £95 last year. Other tickets will be available at £85 and £65 with the cheapest at £45 - which is £5 higher than last term. Manchester United will battle it out with Man City on Saturday for a place in the final, with Bolton facing Stoke in the other semi-final on Sunday. 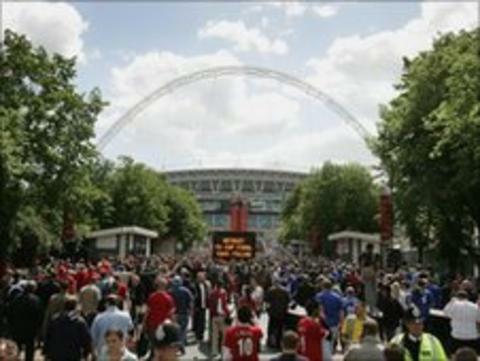 Both finalists in the FA Cup final will receive 25,000 tickets, with those remaining taken up by members of Club Wembley, organisations affiliated to the FA and volunteers from grassroots football clubs across the country. But with the recession still having a major effect, the FA could come in for criticism for the ticket price hike, especially as all four semi-finalists must travel down from the north of England for this weekend's semi-finals, a move which Sir Alex Ferguson has claimed could cause "chaos" in the capital, in addition to huge expense. Still, the FA feels the prices offer good value, especially compared to the Champions League final - which will also be held at Wembley on 28 May - with tickets for that event costing between £80 and £300.